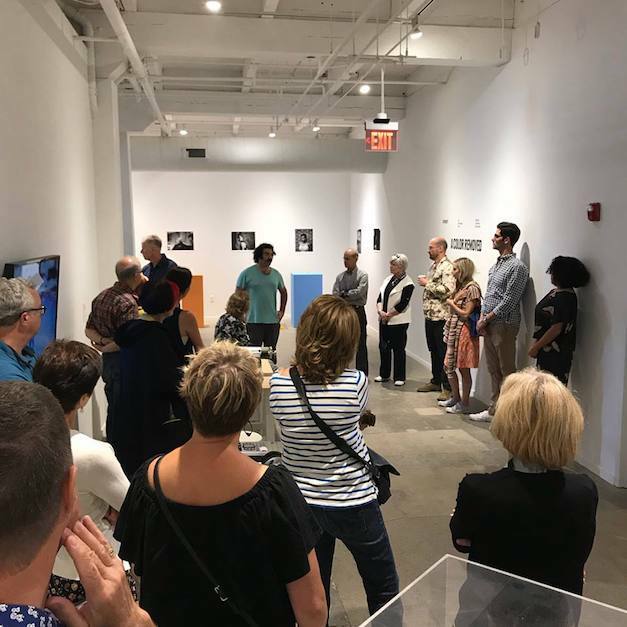 Enhance your CMA membership by joining any of these special interest groups including the Contemporaries, Friends of Jewish Art, Teaching for Creativity and our new Loud & Proud LGBTQ and Allied membership. These groups give you a chance to form a deeper connection with the Museum and personalize your art experience. The Contemporaries is a special interest group of the Columbus Museum of Art who share an interest in contemporary art. Together, they learn about contemporary art, have “behind the scenes” access to museums, private collections, and artists’ studios and select a work of contemporary art for the museum’s permanent collection annually. Annual dues are $650 for 40+ years old and $325 for under 40 years old, and members must have a current CMA membership at the Reciprocal-level or above. For more information, please contact Betsy Meacham, betsy.meacham@cmaohio.org or 614.629.0328. Friends of Jewish Art (FJA) is an special interest group of Columbus Museum of Art that supports exhibitions, programs, and acquisitions of Jewish art. Annual dues are $50 and members must have a current CMA membership at the Reciprocal- level or above. For more information or to join FJA, please contact Bethany Simms at membership@cmaohio.org or 614.629.0344. Teaching for Creativity is a special interest group for educators that supports cultivating creativity in learning. Members of this group enjoy access to resources, workshops, and social gatherings. This group is free for teachers who have a current CMA membership at the Friend-level or higher. Teachers must enroll in person by presenting a school ID to admissions-desk staff at CMA. For more information please contact Amanda.Kepner@cmaohio.org or 614.629.0387. Please note: Special Interest groups are add-ons to CMA Membership. Loud & Proud at CMA is the beginning of CMA’s first ever LGBTQ and Allied membership to the Museum. Loud & Proud members receive invitations to two annual cocktail parties and three evenings with tours led by local drag personalities, docents, and leaders in the community. CMA Loud & Proud memberships also include free admission to CMA, CMA’s collection, CMA’s special exhibitions, free parking, and discounts in the Museum Store, and Schokko Café. Artists are people, too, with lives and stories. We think that art comes to life when you know the story about the artist. CMA’s collection encompasses artists from diverse backgrounds telling inclusive stories about the human experience. With our Loud & Proud members, CMA will highlight LGBTQ artists, as well as, art with subject matter relevant to the LGBTQ community. CMA is proud of our LGBTQ artists. We’re proud of our collection. We’re proud to create a great experience with great art for the LGBTQ community who we invite to be loud and proud at CMA! Each level of Loud & Proud membership includes all benefits of the previous level(s) and will be recognized on the Loud and Proud donor wall. Membership is on an annual basis. + You are a character, and, we want you as part of our story. + Membership to the Museum for one or two named characters. + Invites to 5 Loud and Proud events each year. + You like to explore….let’s go! + Membership to the Museum for two adventurous humans. + Bring a couple guests along for Museum trips. + You are fancy. And, we like you. + Champagne waiting for you at member openings. + You know how to entertain. We do too. + Private Museum tour for you and 6 of your favorite people given by a docent in sparkling attire. (Hopefully sequins, depends on the day). Sparkle not guaranteed. + You are winning. And, frankly… we need you on our team. + Pick a topic or occasion. Our Museum Team will curate an experience you’ll want to tell your teammates about. You plus 6 friends. Winning. + Whether you are a King, Queen, or anything In Between, let’s face it…..